When you’re asked about your fleet’s “green” initiatives, do you answer confidently or go a shade of it yourself? 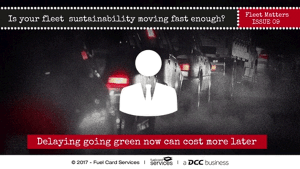 Because the costs involved with moving towards a more sustainable fleet, quickly, can make even the hardiest of managers feel queasy. Or, go green with envy at those fleets which make it look easy. Much more tempting just to put it off for a little longer. Run a few of those vehicles into the ground, or get a cheaper lease deal on an older vehicle, then slowly swap them out for more environmentally-friendly ones in time. The thing is, the longer you wait the more expensive it could get. Or to look at it another way, the sooner you start going green the more you can start to save. Spend now to save later? How does that work? In two ways: firstly, you avoid the penalties that are beginning to land in London and other cities too, for running vehicles with poor emission ratings. And secondly, you start to benefit from new incentives which are appearing as the government desperately tries to meet its emissions targets. It’s a double-win, if you can get past losing some money now. It could be a costly fail if you leave it too long. Read more about it in Fleet Matters here.